It’s been a couple of weeks since Seth let the Kat (and the Emmett!) out of the bag, so I thought I’d stop in and give you guys some insight into the philosophy behind putting these two great characters into PlayStation All-Stars Battle Royale. The team and I attended an event at the Santa Monica Studios last night where we gave media attendees the first hands-on look at our new DLC, including the unveil of a brand new level, so I wanted to give you all a sneak peek at some of their moves and show off our newest level, Fearless! It’s all exciting stuff that I’m eager to tell you all about, so let’s get started. Gravity Rush landed on PlayStation Vita earlier this year, introducing us to Kat. Her tremendous gravity powers, combined with a really charming personality made her an instant fan favorite, and thus an obvious candidate for PlayStation All-Stars. When looking at Kat’s play style in Gravity Rush two things immediately stood out to us: her reliance on aerial mobility and her arsenal of powerful kick-based attacks. We felt it was important to use these two elements as the cornerstone of Kat’s play style, and as such, her move set in PlayStation All-Stars makes liberal use of both. For example, Kat doesn’t have a double jump! Instead, she relies on her Gravity Dash, an eight-direction mini-flight mode to move through the air. This cancellable move affords Kat an unprecedented degree of air mobility and attack potential. Another example sees Kat using her powers of gravity manipulation directly against her rivals. Kat creates gravity wells, which draw in nearby players via her Gravity Attraction attack. Kat’s playstyle is such that she’s most effective when close to her opponents, and while her air mobility and varying kicks allow her to get in close pretty well, Gravity Attraction lets her pull her opponents directly to her. 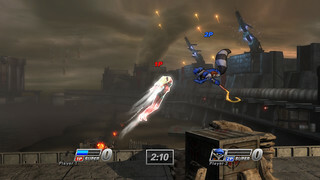 Success with Kat will require players to use all of Kat’s abilities in harmony, and Gravity Attraction plays a key role in accomplishing that. I also want to give you guys a look at one of Kat’s Supers. 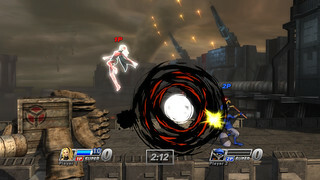 Kat’s Level 1 Super, Gravity Squeeze, is based on her finishing attack so often used to dispatch the bosses in Gravity Rush. Kat leaps at her foe, stealing a giant orb of energy. As she destroys the orb, her victim explodes. If anyone is caught within the resulting blast of energy, they explode too! This is a very powerful Super, but one that will require Kat players to be clever in order to score maximum points. This year also saw the release of Starhawk, a game set in the wild galactic frontier where the quest for Rift Energy comes with a terrible human cost. Starhawk’s main protagonist, Emmett Graves, is a man all too familiar with that cost, his body forever transformed by exposure to the toxic Rift Energy. 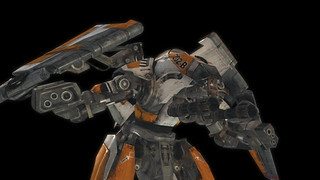 Emmett makes wide use of varying weapons based on advanced technology, most notably through Starhawk’s Build & Battle system. 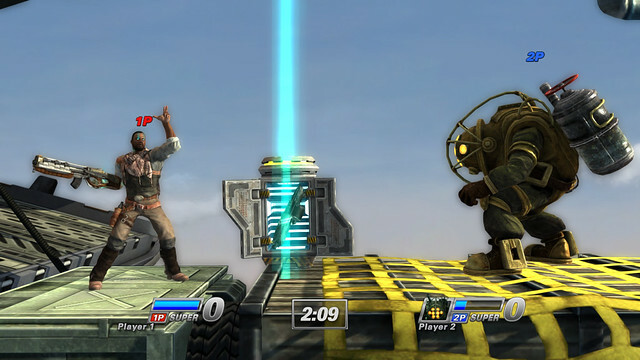 It’s this particular mechanic that made Emmett such a compelling character to the PlayStation All-Stars Team. The first of Emmett’s two most important Build & Battle moves is his Aerial M.A.W Rocket Launcher and Tetranite Grenade Bunker move. This allows Emmett to call down a bunker that when used, completely changes his weapon loadout. The Rocket Launcher gives Emmett access to a long range, powerful, aimable projectile. The grenade launcher provides an equally devastating attack, both in terms of AP generation and versatility, and is used primarily to stop the advancement of opponents in front of Emmett. Both weapons are somewhat slow moving, but more than make up for it in terms of sheer firepower. The second, but equally important Build & Battle move that I want to tell you about is the Union Shotgun and R-Secs Proximity Mine Bunker move. Like the previous Build & Battle move, a separate bunker is brought in from low orbit, this time with ample shotgun and mine ammunition. Choosing this loadout supplies Emmett with devastatingly quick-hitting, short-range firepower via the shotgun as well as excellent space control through persistent mines. Neither weapon offers the range of the rocket launcher or grenade, so good Emmett players will need to be able to master alternating between both loadouts depending on the situation. What better piece of anti-personnel weaponry is there in the Starhawk universe than the amazingly versatile Hawk? 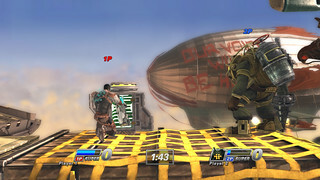 As the ultimate Level 3 Super, Emmett takes control of a Hawk in mech configuration, and is able to chase down his opponents with terrifying machine gun fire and tricky floating mines. And when all else fails, Emmett can transform the Hawk into flight mode and rain down a final hail of bullets that’s tough to survive. It’s an impressive Super, befitting of a universe filled with amazing technology. Before I go, I want to give you all a look at what we have planned for our newest level, which during development has earned the codename Fearless. 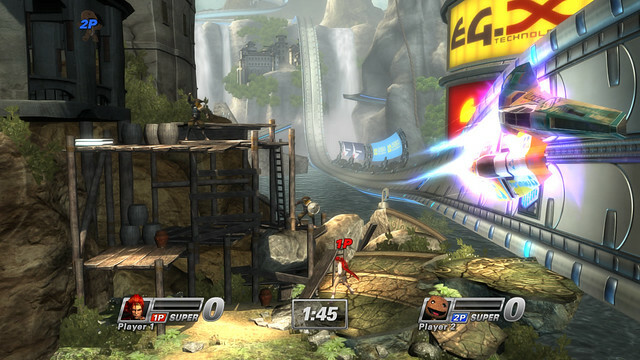 Fearless is a mash-up level that sees the fantasy world of Heavenly Sword meet the futuristic race tracks of Wipeout. In the short time we’ve been working on it, Fearless has become one of the team’s favorite levels, and we think you’ll see why. 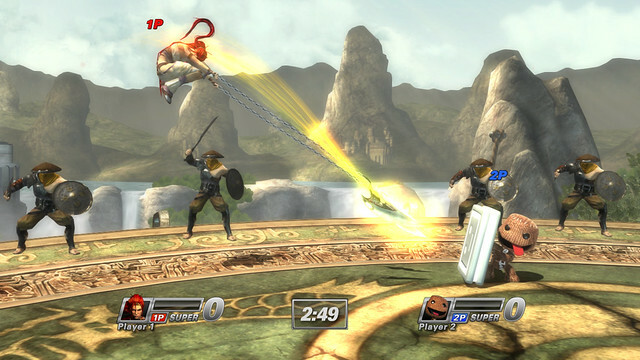 The action in Fearless starts out atop a high column supported by gigantic ropes, creating a scene pulled straight from the world of Heavenly Sword. Our players will battle it out on this high column under the watchful eye of the forces of Bohan. It’s a medium-sized space, free of any platforms, and offers some of the most uninterrupted calm you can find in PlayStation All-Stars. In the distance though, the hum of anti-gravity racing can be heard, and over the course of the match, a familiar floating race materializes. Soon, the battle is interrupted as stray fire from the famous racing ships of Wipeout hits the fighting column, and our fighters come crashing down into a new, more vertical part of the level, the race track cutting straight through the fight space! Any fighter unlucky enough to get knocked into the track or in the way of one of these terrific ships will pay the cost – literally – by receiving a hefty AP penalty. Knowing how to best leverage your character’s moves while avoiding the dangers of the race track are key tools to mastering your fear, and mastering Fearless. We’ve still got a long way to go to complete Kat, Emmett, and our new level Fearless, but I hope you enjoyed this early look into where things are going. We think these new characters and level fit well into the gameplay already established in PlayStation All-Stars, while at the same time expanding the notions of what’s possible within our fight system. We can’t wait for you guys to get your hands on this stuff early next year, but there’s still quite a bit of work left to do before we can call anything finished. With that said, I’ll get back to work. Awesome! Glad to see Wipeout getting some more love. I look forward to playing as Kat, can’t wait to see her level 2 and 3s (Dusty anyone?). I really do hope more of the characters like Sir Dan, Dante, Kat, Emmett, Toro, Heitachi and Fat Princess will have levels. I can only dream of the possibilities. Heys Cyber6x, if you’re a Gravity Rush fan you know that wherever Kat is, Dusty is never too far behind! That Wipeout/Heavenly Sword level looks like fun. Can’t wait to see those two in action…video soon? Great game, looking forward to more DLC in the future! Heys KidCommando, Kat and Emmett aren’t quite ready to show off via video, but rest assured it will happen soon! You guys are awesome and I hope you guys continue to make DLC! A lot of people want to support you guys including myself, but since this particular DLC is free, technically you guys won’t really be getting any money for it. Is downloading this free DLC enough to say that we want more? Can you confirm or deny if Kat and Emmett are in fact rivals or not? Will you guys be showing anything at the VGAs 2012? Heys D-Squad3, The free DLC is our way of saying thanks to you, the die-hard All-Stars fans. If you like the game, the best way to show support is to tell a friend! Looking Good. Game is fun. 1) Full “Cross” features for a cross buy title. Like add an update to sync trophies since for some weird reason they don’t share a list. Other than that it nails all the other “cross” features. SB, If you guys can keep adding great DLC like this every 2-3 months down the line, I see this game being the 2nd most played game on PSN…(COD/ PSASBR/ UNCHARTED)…As always, Keep On Gaming. Wow d-squad’s list (post no. 5) is pretty sweet, I could get behind that. Also, gravity rush and wipeout being my two favorite games on vita right now, I’m pretty sure battle royal will be the next big game I will buy. I have the money for it, but no access to US PSN cards and my CC isn’t working on the PS store. I’m having a new CC shipped to me so I hope that one will fix the problem. Like that you got Wipout stuff gong on in that level. Pretty awesome. …Omar, why cant you do the same with Gran Turismo? Heys MP_is_for_Chumps, we’re always scheming on different ways to incorporate all the great PlayStation titles you love into All-Stars. Never say never! Also, why hasn’t blog share been updated since mid-October? I love going through those. You guys seriously need to fix the balance first, Kratos needs to be nerfed and Sir Dan seriously needs to be buffed. Even IGN came out with a whole video on how he is the weakest/worst character in the game due to his speed, AP gain, and horrible lvl. 1 special. Heys Blkant, We’re constantly looking into character balance issues. With that said, the game is still very early in its life and new strategies are being developed all the time. Rest assured, we will respond to real character balance issues when they arise! This is absolutely wonderful news. Great job guys! I love that you included a Starhawk rep. and his build and battle system! Again, this is the most fun game I’ve played in a long time and the online is working incredibly well!! 2. Is there any chance of seeing a Mortal Kombat rep. (Sub-zero perhaps? he has a great ice clone) since SuperBot has a good relation with Netherrealm? 2. SuperBot would love to have an MK rep in All-Stars! Amazing game that’s for sure! Having so much fun with PSASBR! Glad to see 2 new characters and a map so far for free!! Looking forward to downloading this. Also, your game is a true success and I don’t mind paying for any DLC after this first batch. You deserve the support! The game is awesome and this DLC looks amazing. I can tell you guys really studied Gravity Rush when making Kat’s play-style! Keep up the great work Omar and Superbot! I want more games from you guys! How will the costumes work? Obviously there will be two in game ones, but will there be a third costume available at some point near when they are launched like how there are pre-order costumes for the original 20 roster members? Heys LX_Theo, this sounds like a great idea! No comment, stay tuned, etc. Really enjoying the game so far and the DLC looks great. Any chance of seeing future DLC (character or level) inspired by Syphon Filter or the Legacy of Kain series. I would really dig that. Please make SEASONAL 1v1 Tournaments. I know you don’t want to spread the community between too many online modes but if you do it on a season-basis I see this working quite well. And if catches up popularity you could leave it as a standard online mode. Please, just try it, this game is seriously lacking 1v1 options. Heys MarinoBrea, we’re exploring the possibly of adding 1v1 to Quick Match and maybe even for a season or two in Tournament Mode. No guarantees, but we’re heard you all loud and clear on this! 1) when can we expect new items to be added i to the game? I’d love to see the paintinator from LBP to be in the game. Ratchets groovetron would,be cool to. 2) will there be new taunts and costumes added into the game as well? It would be amazing if you added nathan drake’s pump taunt into the game as well as his donut drake costume. 3)will a lobby system feature ever added into the game? Id love to create matches that are just as customizable as the offline versus mode. 1. We’re adding the Medusa Head Item via a patch set to go live any day now, so look for that, it’s pretty cool. 2. and 3. Definitely exploring these as well. No guarantees, but your suggestions are noted! Kat’s moves look interesting, hope we can see video footage soon. For your next batch of DLC characters, I hope you take a good look at Jennifer Tate from PS2 classic Primal. I’m so stoked right now! Kat looks great. Emmett is everything I was hoping for…especially that level 3…and just the other day I was wondering about where Nariko’s level was. Looking awesome, Superbot! Heys TomatoDragon, wouldn’t that be fun? 1) Is Raven from Gravity rush an option for hte future? 2) Can you please Beef up Radec and give us Sev? 3) Nathan Hale, Joseph Capelli? 4) Is beefing up the weaker characters to take on Nariko and Kratos a possibility? Takes a lot of work to bring other characters on par with those two, but I don’t want them nerfed either as they play perfectly right now. 5) Why do I have to earn trophies twice for this game on Vita and PS3? very exciting news … the new stage looks wicked ! did anyone preorder the PS3 version & actually get the bonus costumes onto the Vita ? I only have them on the PS3 – I didn’t connect my Vita to the PS3 but instead DLd from my list on the Vita store & every time I try & input the bonus costumes code to the Vita it tells me they cannot be DLd to the Vita … can anyone confirm that if I delete it & hook it up to the PS3 I’ll get my costumes ? thanks …. The detail you put into these characters is so far beyond fan service it astounds me. Thank you for your dedication. Thank you SuperBot for the fantastic continued support of this game! My roommates and I cannot stop playing it. I cannot wait to get my hands on these cool new characters. I had a crazy dream two nights ago. In that dream, Sonic, Gillius (Golden Axe) and Opa-Opa (Fantasy Zone) where fighting on a colossus from Shadow of the Colossus. Now I kinda wish to see a Sega DLC Pack. This is nice and all. but really you guys are being ridiculous. When the heck are the PRE-ORDER DLC COSTUMES going to work on the Vita!! I bought the physical Vitw game and when I input the code I didn’t get the costumes for the Vita only the PS3 and it’s cross content so I’m suppose to get both!! Can you guys just fix this before worrying about anything else. This is completely unfair for people like me and everyones ignoring it and when I call sony they say they don’t know what to do cause normally theyd just add it to my DL list but because it’s only retreive able by code they can’t do it. FIX THIS, me and my bro plus everyone I know with the game on the Vita have this issue!! Heys Teflon02, we’re aware that some people are having issues with their pre-order costumes and we’re working hard to resolve them. Please be aware that as this issue oftentimes comes down to individual retailers, it may take some time before all issues are resolved. Also, the work towards this DLC in no way slows down the work that goes in to solving your issues. Thanks for the comment! Wow this game keeps getting better and better! This is truly the ultimate tribute to Playstation! Any fan of Playstation fan should own this game for that simple reason! So when the DLC comes out…will we have two download two seperate copies (1 for ps3 1 for vita) or will one download work for both systems? I’m hoping for a JRPG character in the next DLC. It’s really good to see SuperBot are engaged to support the game. But I’m very dissapointed to the fact that characters like Fat Princess, Parapa and Emmet Graves are in the game istead of other gen define characters. Fat Princess, Parappa and Emmet Graves aren’t All Stars! Gabe Logan, Snake, Crash ARE, having more then 4 games each!! SuperBot are a good studio, but silly choices. I really hope to see those characters via DLC, even thinking they should be in the disc at launch. PS: I WON’T BUY UNTIL GABE LOGAN IS IN! @35 …. you will have to DL to both devices …. something this small will be quick & painless. Thank you Omar Kendall, and the entire SuperBot Entertainment crew, for creating this dream game for us loyal Playstation fans! Please do not let the sales of this game strip future DLC plans from us. We, North Americans, will continue to support your game as long as you guys keep the DLC coming! Ohh and I really hope that Konami allows you to put Old Snake, Solid Snake, or Naked Snake in Playstation All Stars Battle Royale. I never imagined Emmet to be in the game, and I really wanted a WipEout track since the beggining. No Buyers remorse here. Drake, Ratchet, and Evil Cole will keep my occupied until Emmet arrives. Along with starhawk. Hopefully Nathan Hale and some JRPG characters comes in the next batch of DLC. and the King of all Cosmos from Katamari. You guys have replaced Naughty Dog from my “Favorite Developers” list! Sweet! I am getting this game pretty soon ! Just gatta wait until I get paid! Just logged to give congratulation for the amazing job! I liked this infos a lot and I know its going to be great! Like #20, I also would really like the Groovitron as an item. I know it takes a lot of work to create dance animations for each character, but it’s worth it for the humor. Other than that, Finn from Sorcery, Shank, and the trio from Trine could have some really unique movesets. And some secondary characters from already represented franchises (Qwark, Nefarious, Murray, Bentley, Clank and Daxter by themselves) would be cool. Regardless, I’m down for any DLC support, preferring it over of a sequel. @37: Parappa, has had 3 games if you include Um Jammer Lammy spinoff, as well as anime and merch. Never mind being one of the first mainstream rhythm games on consoles. As well as one of the most memorable series ever. If someone played it on a demo disc, they will remember him. Hey Crazymanwalking1, PS Vita and PS3 players can face off against one another in any of our online (Tournament and Quick Match) games. 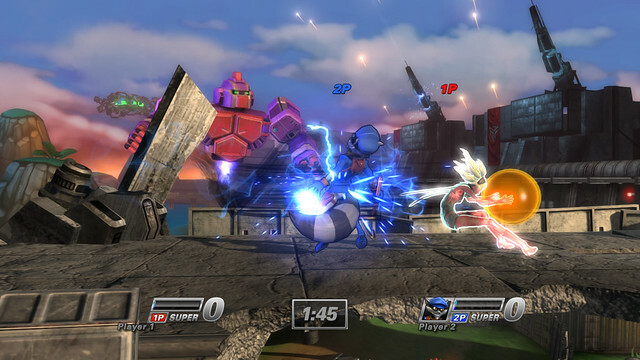 Also, PS Vita and PS3 players are able to invite one another into any Versus Mode game. Hi Omar! Really loving your game, it is a great starting point for the franchise (hopefully!) and love seeing Kat being included and Nariko getting a place to call Home. Player Color: I think it would be awesome that instead of the Red/Blue/Green/Yellow the character color would be Pink/Red/Blue/Green, using the same Pantone from the PlayStation button controllers. It is a small detail but I guess it would be easy enough to implement and adds a bit of brand presence. Super color: One complaint I do have with the game is that characters can become a bit hard to track. Would it be possible for their super “glow” to be based on the player color, rather than being the default blue? It would help a ton to differentiate among players specially when things get hectic. And for DLC characters…a guy can dream right? Gran Turismo X Gravity Rush, Shadow of the Colossus X Journey, Mark of Kri, Medievil X Fat Princess, SoundShapes X Dyad. Thanks and congrats on a great game :).